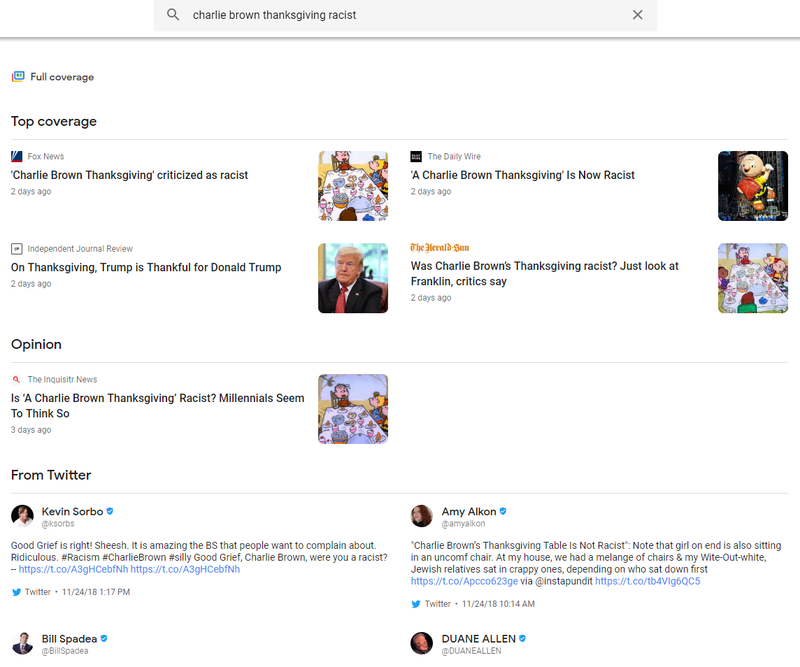 No serious person thinks the over 4 decade old Charlie Brown Thanksgiving Special is racist. It is far more plausibly the exact reverse – a pioneer in depicting a black child as a complete equal. Yet such a story is the viral click of the season. If you’re a respectable publication, do you choose not to publish it? What if all the other former gatekeepers do, and the news barbarians are already in the gate? What gate are you guarding anymore? Reverse engineering how I came to hear the racism charge is as follows: It’s TheHill.com quoting Comicbook.com quoting tweets. It’s more than The Hill of course. What irresistible click-bait! I can only imagine the pain the author Joe Concha had to go through when he could have been digging into a story that will be material, say, at the end of the week. Old line publications should choose. Be in depth enough to command a premium or be hip, fast and easily outraged enough to stay on the vanguard of social media phenomena reporting. The middle ground, no matter how journalistically diligent, does nothing for their brand.